BCDB Rating: 3.7/5 Stars from 11 users. This page has been viewed 94 times this month, and 13478 times total. Cartoon Characters: Fa Mulan/Fa Ping, Mushu, Captain Li Shang, Yao, Chien-Po, Ling, Chi Fu, Shan-Yu, Fa Zhou, Fa Li, General Li, The Emperor, Grandmother Fa, Cri-Kee, Khan the Horse, Little Brother the Dog. Vocal Talent: Ming-Na Wen (Mulan, speaking), Lea Salonga (Mulan, singing), Eddie Murphy (Mushu), B.D. Wong (Li Shang, speaking), Donny Osmond (Li Shang, singing), Harvey Fierstein (Yao), Jerry Tondo (Chien-Po), Gedde Watanabe (Ling, speaking), Matthew Wilder (Ling, singing), James Hong (Chi Fu), Miguel Ferrer (Shan-Yu), Soon-Tek Oh (Fa Zhou), Freda Foh Shen (Fa Li), Pat Morita (Emperor), June Foray (Grandmother Fa), Frank Welker (Khan, Little Brother, Cri-Kee). Directed By Tony Bancroft, Barry Cook. Associate Producers: Robert S. Garber, Kendra Halland. Animated By Mark Pudleiner (Mulan, Fa Zhou), Bill Waldman (Shang, Fa Li), John Webber (Mushu), Ian White (Yao, The Ancestors), Dave Kupczyk (Chien-Po, Ling), Anthony Ho Wong (Shan Yu, Falcon, Elite Huns), Branko Mihanovic (Khan, General Li), Jerry Yu Ching (Chi Fu, Grandmother Fa), Anthony Wayne Michaels, James Young Jackson, Rune Brandt Bennice, Carol Seid, Tom Gately, Elliot M. Bour, Robert Espanto Domingo, Joe Haidar, Marcelo Fernandes De Moora, Craig R. Maras, Philip Morris, Theodore Anthony Leely, Charles Bonfacio, Dominic M. Carola, Jamie Oliff, Robert O. Corley, James Baker, Byron Howard, Christopher Bradley, Michael Benet, Daniel M. Wawrzazek, Bert Klein, Travis Blaise, Tony Stanley, Trey Finn, Sasha Dorogov, Darko Cesar, Todd Waterman, James Baker (Mushu). Supervising Animators: Mark Henn (Mulan), Tom Bancroft (Mushu), Barry Temple (Emperor, Cri-Kee), Joe Haidar (Fa Zhou, Fa Li), Jeffrey James Varab (Granny Fa), Alex Kupershmidt (Khan, General Li), Broose Johnson (Ling, Chien Po), Ruben Aquino (as Ruben A. Aquino) (Shang), Pres Romanillos (Shan-Yu), T. Daniel Hofstedt (Emperor), Aaron Blaise (Yao, Ancestors). Lead Animators: Brian Ferguson (The Matchmaker), Shawn Keller (Little Brother). Character Animator: Mark Pudleiner (Mulan). Effects Animator: Kevin M. O'Neil. Written By Joe Grant, Rita Hsiao, Chris Sanders, Philip LaZebnik, Raymond Singer, Eugenia Bostwick-Singer. Story: Robert D. San Souci. Based on a Poem by: Anonymous. Songs: Vanessa Mae, Matthew Wilder. Assistant Editors: Robert Brakey, Julie Rogers, David Teller. Associate Editors: William J. Caparella, Albert Coleman. First Assistant Editor: Sharon Smith Holley. Casting Assistant: Stephen Blackehart, James Curreri, Tamlyn Freund, Meredith Layne. Production Manager: Lisa M. Smith. Digital Production Manager: Kirk Bodyfelt. Key Visual Development: Gay Lawrence, Valerio Ventura. Journeyman Layout Artist: Andrew Hickson. Color Stylist, Florida: Kenneth Landrum. Camera Operator, Florida: Karen N. Sickles. Camera Operator, Digital: David J. Rowe. Compositors: Jason Leonard, Robert Buske, Earl Coffman. Software Development, Florida: Joel Davis. Senior Technology Manager: Enrique Santos. 2-D Software Manager: Kevin J. Hussey. 3-D Software And Core Manager: Edwin R. Leonard. Digital Ink And Paint: Nika Dunne. Render I/O Administrator: Christine E. George. Final Check Supervisor: Michael D. Lusby. Music Executive Producer: Chris Montan. Music Production Supervisor: Tod Cooper. Music Production Coordinator: Denience Larocca, Tom Coyne MacDougall. Music Arranger, Songs: Douglas Besterman. Music Arranger, Vocal Arrangements: Matthew Wilder. Music Recording Assistants: Norm Dlugatch, Andy Bass, Thom Cadley, Lois Carruth, Andy Manganello, Andrew Page, Alan Sanderson, Paul Wertheimer, Rich Weingart. Orchestra Contractors: Sandy De Crescent, John Miller. Supervising Music Copyists: Dominic Fidelibus, David Friedman. Assistant To Jerry Goldsmith: Booker White. Vocal Contractors: Jess Harnell, Bobbi Page, Reggie Wilson. Singers, "A Girl Worth Fighting For": Lea Salonga, Jerry Tondo, Matthew Wilder. Singers, "A Girl Worth Fighting For" And "I'll Make A Man Out Of You": Harvey Fierstein, James Hong. Singer, "Honor To Us All": Beth Fowler. Singer, "I'll Make A Man Out Of You": Donny Osmond. Singers, "True To Your Heart" (As 98 Degrees): Justin Jeffre, Nick Lachey, Jeff Timmons, Drew Lachey. Sound Effects Editor: Bryan Bowen. Supervising ADR Editor: Curt Schulkey. Supervising Foley Editor: Kelly Oxford. Foley & Sound Effects Editor: Chris Hogan. Score Music Editor: Kenneth Hall. Assistant Score Music Editors: Robert Bayless, Tom Hardisty. Preview Music Editor: Tom Kramer. Sound Re-Recording Mixers: Terry Porter, Dean A. Zupancic. Technical Director: Thomas C. Meyer. Technology Crew, California: Mark W. Gilicinski, Robert A. Mortenson, Jack Muleady, Graham S. Allan, Richard M. Barnes, Glenn Bell, Michael S. Blum, Michael C. Bolds, Brad Brooks, Letha L. Burchard, Mark R. Carlson, Nhi H. Casey, Loren Chun, Peter Chun, Michael Clay, Ray C. Coleman, Maria Gomez De Lizardo, Scott Dolim, Elena Driskill, Norbert Faerstain, Robert Falco, Kevin G.J. Freels, John D. Hoffman, Le Hua, Shyh-Chyuan Huang, James P. Hurrell, Kevin E. Keech, Kimberly W. Keech, Daniel C. Kim, Michael R. King, Hans Ku, Mike Larkin, Li-Ming 'Lawrence' Lee, Sally Lee, Stanley B. Lippman, James Macburney, Michael McClure, Kevin A. McGuire, Jim Meyer, Christopher D. Mihaly, Thaddeus P. Miller, Jeff Nash, Michael Neville, Lyle S. Nojima, Troy R. Norin, David Oguri, Keith Otis, Ron L. Purdy, Carlos Quinonez, Lisette Ranga, Dave Remba, Jeff Rochlin, Kai-Zhen Ruan, Michael Saitta, Nasser B. Salomon, Fe Samala, James A. Sandweiss, Todd Scopio, Jeffrey Sickler, John Stimson, Charles Stoner, Sandy Sunseri, Joe Suzow, Mark M. Tokunaga, Laurie Tracy, Mary Jane 'M.J.' Turner, Jon Y. Wada, Doug White, Derek E. Wilson, Thomas A. Wong, Fran R. Zandonella, Michael Zarembski. Technology Crew, Florida: Charles Collins, Raul Anaya, Matt Bialosuknia, Carol J. Choy, Jefferson Crutchfield, Larry Edminister, Don Gworek, Dwayne Harris, Dana Haukoos, R. Todd King, Jerry Lynn Lake, Barbara Lebruno, Tina O'Hailey, John Outten, Carmen Perreault, James Pirzyk, Deborah L. Snead, Tom Talbot, John W. Wheeler. Additional Production Supporter: Kevin Susman. Production Assistants: Eric Dapkewicz, Thomas Grealy, John Damien Ryan. Do you have anything to add to this page? 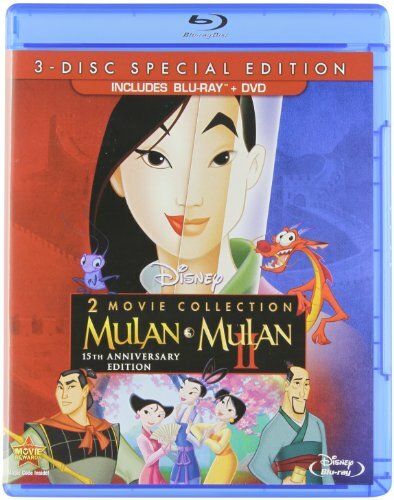 Have we made any mistakes... or do you have any additional information about Mulan? If so, we would love to hear from you. Please send us a quick note with your additions or corrections to this page, and we will make the corrections as soon as possible! Below are comments about this cartoon submitted by people who have seen this show. 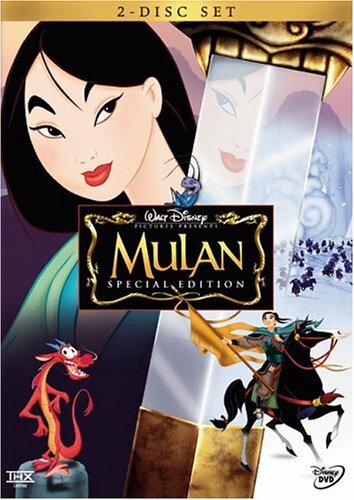 Take a look and see what others have said about Mulan. We want to know what you think, too!! Feel free to share your own opinion- we do want to hear from you! You can add your own comments here. Mulan by Big Cartoon DataBase is licensed under a Creative Commons Attribution-NonCommercial-ShareAlike 4.0 International License.